I'm always in search of dog friendly places, whether it be dog friendly hotels, dog friendly parks, dog friendly beaches, dog friendly restaurants, or other public places that allow dogs. Recently we visited my family in South Florida, so of course one of the first things I wanted to do was take Icy and Phoebe to a fabulous Florida beach! Icy was so excited to be at the beach in Juno Beach, Florida! I had heard about dog friendly Juno Beach in Florida. There are lots of articles and photos online showing dogs having a blast on Juno Beach. 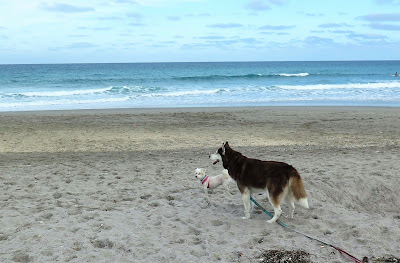 On our visit to Florida we stayed in West Palm Beach, about 25 minutes South of Juno Beach, so we planned a day at the beach in Juno with the dogs. Dog friendly Juno Beach is beautiful, unspoiled, and far less crowded than West Palm Beach. Access to dog friendly Juno beach can be found on Ocean Blvd. (A1A) and Marcinski Road. We parked in one of the ample parking lots at the intersection of Ocean Drive and Marcinski Road. Parking is Free, and there are rest rooms in the parking lot, which is a huge convenience! There are even water faucets at the beach entry area where you can wash your feet and rinse your dog off after a day of frolicking in the sand! In this short (12 sec.) video, you see Icy and Phoebe having fun running and playing on Juno Beach! One thing to watch out for is that although Juno Beach is indeed a dog friendly beach area, not every beach in Juno Beach allows dogs. Actually only about 2.5 miles of the beach allows dogs. As you walk along Ocean Blvd, at each of the various beach access points there are steps down to the beach. At some of those access points you will see "No Dogs Allowed" signs. The beaches located North of the pier pictured above and the Juno Beach lifeguard station do not allow dogs! It's not easy to figure that out when you are already on the beach and want to take a stroll along the shore. We found out in a not so pleasant way that these beach areas were not dog friendly. We were walking along Juno beach when a very nasty elderly man rushed over to us. "No dogs are allowed past the lifeguard station!!" he shouted at us. We apologized saying that we weren't aware of that. As we turned to leave the man was muttering under his breath about always having to "do the lifeguard's job". Not a very pleasant encounter but we would not allow this ornery man to ruin our day at the beach! Driving along the road we hadn't noticed that other beach access points had No Dogs Allowed signs, we thought all beaches in the Juno Beach area were dog friendly. Not so!! You have to look for signs up by the stairs indicating whether or not dogs are allowed on any particular beach. Just a couple of miles North of Juno Beach is the town of Jupiter. All the beaches in Jupiter are dog friendly. Both areas have gorgeous beaches with lovely clear Florida ocean. Jupiter is a gorgeous beach town, and there is plenty of free street parking along A1A, the main beach road. Although we loved our day at Juno Beach, next time I think we'll travel just a little further North and check out one of the many dog friendly Jupiter beaches. I understand there are some dog friendly restaurants in both Juno Beach and Jupiter, but unfortunately we didn't have time to visit any of them. We will next time for sure! If you decide to visit either of these dog friendly beaches in Florida, please be sure to practice great down owner etiquette! Always keep a close eye on your dog to ensure that if they poop, you immediately clean up after them. Also ensure they aren't jumping on people, being aggressive towards other dogs, or otherwise not minding their manners. Great dog owner responsibility is what helps keep fabulous beaches like Juno Beach and Jupiter beaches dog friendly! Looking for a dog friendly hotel? Some hotels are truly pet friendly, but some are merely pet tolerant. Here's how can you tell the difference in A Tale Of Two Dog Friendly Hotels. Have you been to any great dog friendly beaches? Leave us a comment and tell us about your favorite dog friendly beach! Join me on the Rascal and Rocco Pet Parade Blog Hop!! At the north end of the state, we've really liked the beach at Marineland. It's generally uncrowded and dogs are allowed everywhere. Oh that sounds nice, Pamela, thanks for sharing! Thank you for Pet Parading with us!! You girls are so good to be able to run off leash on the beach. The boys would lose their minds. Hopefully, we can take them to the Gulf this summer. Thanks for co-hosting this blog hop! It took awhile to feel secure enough to let Icy off leash, but she did great and Phoebe never runs away LOL! I'm glad you had so much fun at the beach! We love going to Holden Beach in North Carolina. It was a great time, I'm so glad we went. Holden Bch sounds nice, NC has such nice beaches. I have visited Huntington Beach in California at the time of Disneyland trip. Really, a good dog-friendly beach well maintained by a nonprofit organization. I'm sure my Magical-Dawg would have loved visiting this beach. He enjoyed wading but I bet the surf might have put him off a bit! Great beach photos! I think pretty much all of Oregon's beaches are dog-friendly. Mr. N has a terrible habit of inviting himself onto other people's towels/space but at least he's good about picking people who find it entertaining. I wish there were more dog friendly beaches by me! Glad you didn't let the older man ruin your day. What a party pooper!! Dog-friendly beaches are really hard to come by around here. We used to love the old quarry down South ... it was filled with spring water, and an unofficial dog beach. They look like they're having a lot of fun on the beach! I don't have any large beaches near me, but I know one of my dogs would love it since she loves to swim! I'm a little jealous you were able to enjoy Florida. I'm so over this winter. Did you drive or fly with Icy? My dogs are about her size and I don't feel comfortable flying with them in cargo (even before the United incidents). Looks like Icy and Phoebe really enjoyed themselves. I love walking along the beach and letting the waves rush up on my feet. Sorry about that poor encounter with that rude guy though. Glad you didn't let him ruin your trip. I find it infuriating when there are miles and miles and miles of beach and the dog beach is a whole 30 feet long. LOL This looks much better. North Carolina has dog-friendly beaches too...Corolla in particular. Sorry that geezer wasn't dog friendly...lol. I'm adding this to my list of dog-friendly beaches. They aren't always easy to find. Great point about etiquette - so frustrating when other pet parents ruin these fabulous destinations for the rest of us. Glad you found some beach area that was dog friendly. I know a lot of the beaches in South Carolina aren't very dog friendly, especially during tourist season.